Well, I decided I'm going to custom-order a zipper for my brother's sweater, so it may be a while before that one's actually done. It's not very functional without being able to zip it closed (the stretchy ribbing makes it look like there's no front at all! ), so he'll just have to wait on that one. Good thing it's still August! 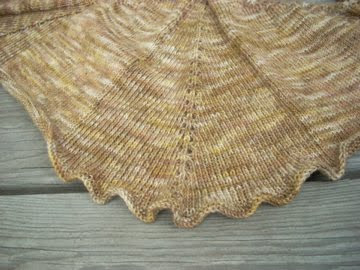 I finished the shawl I'm test knitting for Stephen West last night and now it's blocking. I liked the way the edge looked before blocking though. It actually reminded me of those flowers I posted about in my last post, which I now know are called "Cockscomb." Thanks, Anne! I think I may have had enough yarn to do one more repeat before the edging, but I didn't want to chance it. 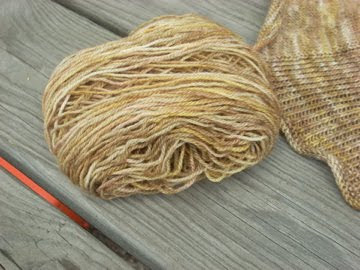 I love this yarn though, Pagewood Farm St. Elias (80% BFL, 20% nylon) in the Mississippi Mud colorway. I'll post more details when I have finished photos. You can find the pattern page on Ravelry, but it won't be available until the 31st. I should start knitting the second sock for my brother, he's heading off to school a week from today. I dunno about Mississippi Mud, but I know that now I want a caramel sundae. I have faith that you'll not end up like me with a bunch of "just about done" projects. The shawl looks great. 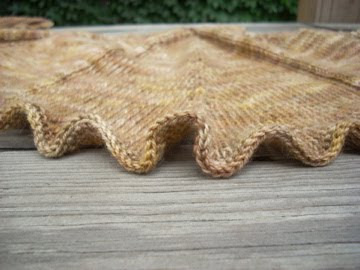 I agree that the edge looks kind of cool waving like that, but a freshly blocked shawl is a beautiful thing. There is a hot dog place nearby named Mississippi Muds - it's located right next to teh Niagara River which makes no sense at all. The shawl does look delicious though. Hi The Armenian participant was also doing well in the tele-voting after the show with her song scoring high and Armenia staying on top (or close to top) among 13 participating nations until the last national voting results were announced. Armenia needed at least a 7-pointer from the last announcer, Macedonia, to become the winner, but eventually got only one point. Her rival, the Netherlands, meanwhile got a high score of 10 that enabled its participant Ralf to win the contest with a total of 121 points scored for his Click Clack song. Armenia and Russia, meanwhile, shared the second and third places with 116 points each. The dramatic finish resembled the 2007 Armenia debut at Junior Eurovision when its participant, the Arevik children’s and youth pop-folk ensemble, stayed in the lead among 17 nations almost for the whole duration of the voting and was unseated from the top spot by Belarus only after the last round of voting from the rival nation (proving a point short of victory).